A Sharp knife and Right trick will make field dressing easy. Here are best tools for this job. The wild hunter loves to use field dressing knife because it makes field dressing very easy and comfortable. Hunting is one of the ancient and most antique hobbies that we are still enjoying. Field dressing is a process of preserving meat by removing the internal organs of a hunted animal for long-term use. You have to do this before losing body heat to maintain the ﻿quality ﻿of the meat and save from bacteria. It makes you able to carry the larger game from the hunt area considerably easier. For the Long life of meet, you have to keep it freeze under 40 degrees. Field dressing required a right shape, sharp and easily manageable knife. A Filed Dress Knife considered as the most practical tool as compare to Saw and Axe. 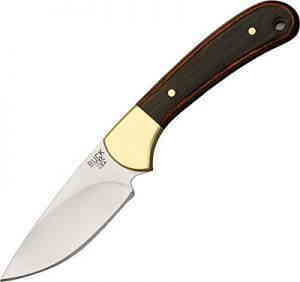 Buck Knives 113 Ranger is especially designed for skinning game. It has overall length about 7-1/4 inches, ﻿and ﻿weighs about 5.2 oz. 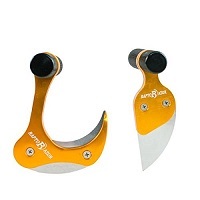 This product comes with 3-1/8 inches 420HC stainless drop point blade. Proudly can be said that it has made in U.S.A. Its American Walnut handles with Bras Bolster guard and helps in holding it easily. 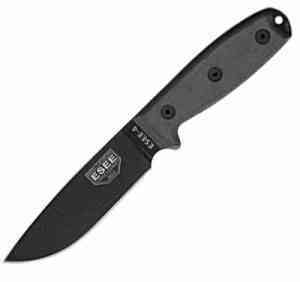 ESEE Knives Model 4 has plain edge. It designed for hunting games. The overall length of the knife is 9 inches. In addition, it weighs only 8 oz. 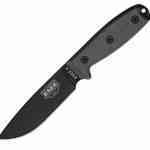 It has 4-1/2 inches 1095 black high Carbon steel standard edge blade. We suggest this product to all hunters. It offers you a rounded thump with rope hole. 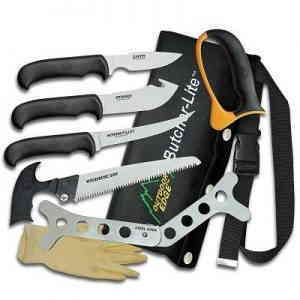 Outdoor Edge Butcher-Lite Kit knives are professional aimed set. This package includes a set of knives for hunting games. It includes capping knife, gut hook skinner, boning knife, and wood-bone saw. Moreover, this package also contains other accessories like as, tungsten Carbide sharpener and game cleaning gloves. It weighs only 2.4 pounds. 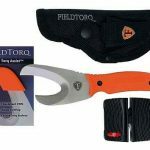 FieldTorq Knives designed for perform the field hunting game in an easy way. This product is able to unzip the large game animal within a few seconds. The included gut hook would not lock with hair. Because of dull knifepoints and enclosed blade, it never stabs or cut the gut, bladder, or yourself accidentally. What’s more, it also creates a comfortable sure grip in checkered orange fiberglass Reinforced Nylon. 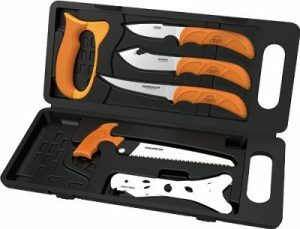 Outdoor Edge WP-2 is the lightweight set of knives, designed for wild hunting games. 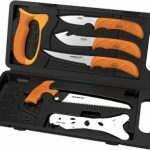 This package has 8-piece set of knives with hard side carry case. These tools are as capping knife, gut hook skinner, boning knife, bone saw, tungsten carbide sharpener, and game cleaning gloves. Its blaze-orange handles provide you an enhanced grip. You never get lost the horn design inlay. Here are some main points which should be kept in mind. 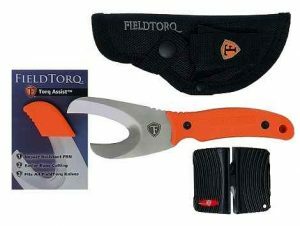 There are two types of field dressing knives available in market 1st one is fixed blade, and the 2nd one is foldable. ﻿Hunter ﻿uses both knives commonly for animal field dressing. Fixed blade consider more durable and has fewer drawbacks, as compared to the folding knife. Mishandling of it could injure you so be careful while carrying. The folding knife is safe to carry as compared to the fixed blade but with the passage of time locking, mechanism getting lose. Before choosing the hunting knife, you should consider which size game you want to hunt. For example, using a larger knife than a rabbit could be dangerous or you might get an injury. You must ideally balance a knife in case of hunting deer. The recommended knife length for field sharpening is 3 to 5 inches. Usually, most of the hunting knives made of either the stainless steel or carbon steel. Each type of material has significant influences on each other. So, this impact depends on the preference of the most users. However, the carbon is quite hard and retains its sharpness for long a while. The disadvantage to it is, it has the risk of rusting. On the other side, the stainless steel metal is rust-free. It prevents the rusting in any way to the knife. It can quickly dull as compared to the carbon steel. Being a hunter your knife must be sharp and strong. It must be durable enough that it may not break easily. In field dressing, you must have a knife with a full tang feature. It has various vital advantages, as the blade part extends to the handle. You must be aware that folding knives do not have this feature. That is one of the main reasons, why most hunters choose fixed-blade knives. Another main feature you have to consider before buying the filed dressing knife is its handle. When you wear the gloves, then there is no chance that your hands get bloody. As well as, it might affect how you can grip your knife. Wooden made handles are the cause of slipping your hands when it is wet. So, the perfect material for a knife handle is plastic rubber. It is well suited because it is quite easy to grip especially when the handle is bloodied. It is clear that you cannot carry your knife with you without the knife cover. A knife without cover may injure you or someone else. You must have a case of knife for protection, which also survives in different weather conditions. For case, Nylon material is mostly preferred than others. This material has its proprieties being a synthetic material. Besides, it is also inexpensive, and you can afford it. The next and finally important factor you must have to consider is the price of the product. However, it does not matter to people who are wealthy. While, if you can afford the high priced product than remember that the inexpensive items have low-end qualities as well. 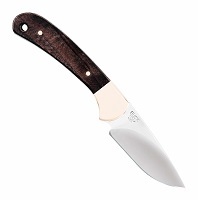 These days, it is the specific matter of picking a knife among the wide-ranging items on the market. To remain your hunting knives in perfect state last for long a while, you have to care properly. Even without proper maintenance, you cannot keep your stainless steel knife rust-free. It does not matter either you have a fixed or foldable blade. Let me tell you about the main steps you need to take. The most essential step about knife maintenance is to know how to sharpen the knives. When you use your knives repeatedly, you have to sharpen them. On the other side, the first thing you have to consider for sharpening the knife is the kind of sharpener. Stone knife sharpener are ancient and well-known way to sharpen the knives, yet it is quite difficult to use. While you are using the sharpening stone, you have to consider the following points. In order to keep your knives rust-free and to get rid of dirt partials, you have to clean them properly. As we know that steel is the most sensitive material to rust, even sometimes stainless steel also rusts. So, before storing your knife you need to first clean it. This step ensures that, you can enjoy the knife service for long duration. Below are several steps to follow before storage your fixed-blade knives. First, scrub the knife with water and soap. Then, apply a thin layer of oil to keep the knife away from rusting. If you want to store your knives for a long while, then do not put them in the leather case. The oil must be food-proof. For knives with carbon steel blades, use water and baking soda to clean. While for stainless steel blades, clean them with dish soap and water. As the folding knives have moving parts, so you must pay extra-ordinary attention to them. Such knives just not need to protect them from rust, yet need to lubricant the moving parts too. For lubricating the folding knives, use needle applicator, as folding knives include smaller areas that need lubrication. In this regard, the applicator is greatly helpful. As fixed blades need perfect case for storage, so you should have to retain its proper maintenance. The most of new cover materials like Nylon and Kydex do not require any specific attention. But, the enduring leather cover must have to pay special concern. It is very simple to maintain your leather sheath well. You just need to follow several protective measures. Always clean the leather sheath properly and moisturize it. Neither put it out exposed to sunlight for long period nor keep it wet. Do not recommended to clean in automatic dishwasher (it may cause rusting). Finally yet importantly, maintenance and paying proper attention does not bound you in any trouble. After hunting, you should gut the deer or field dressing immediately, when the body heat remains. Otherwise, bacteria can encourage on the body, it would make your beef unbeatable. Knives are classified on the basis of their features, advantages and drawbacks. A field-dressing knife is another name of deer hunting knife. They have great number of uses outside the deer hunting. To get the deer meat, you must consider a knife the following things to do. Deer hunting is all about gutting the internal organs of the deer. This process requires a knife that stub through the skin. In addition, it is the most essential step in preserving your meat for long time. If you are hunting deer for their meat, than you have no uses for its skin. Skinning is the second step in field dressing. This process helps you to separate the meat from its fur for easier access. After both of the above-mentioned steps, deboning comes next. This process includes separating of meat from the bones. For that, you need a perfectly suitable knife, which do easily. Using the best boning knife saves your time and effort alike. Similarly, it also helps you to increase your deer meat production. 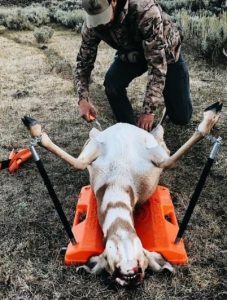 Butchering is the most important step in field dressing. In this step, you have to cut up the meat to be stored in your bag. It is very heavy to carry the deer with its bones and skin, so selecting a perfect butchering knife helps you in this regard.